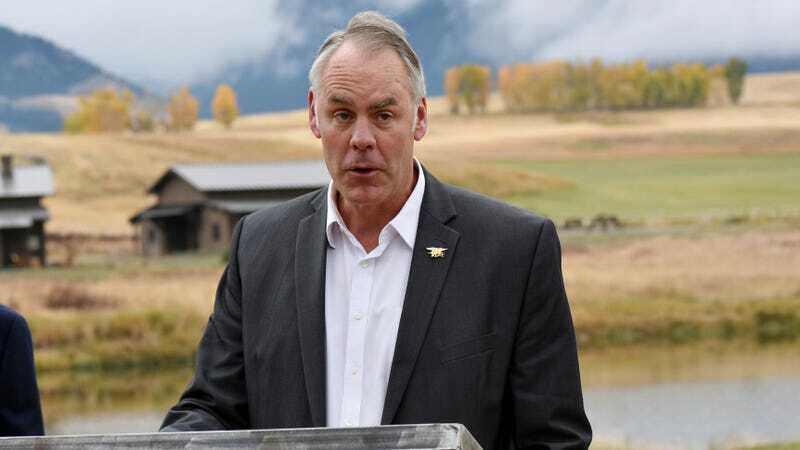 Ryan Zinke announcing a ban on new mining claims in mountains north of Yellowstone National Park near Emigrant, Montana in October 2018. Interior Secretary Ryan Zinke—a man who wears ranger hats backwards and spreads conspiracy theories about how “radical environmentalists” are responsible for wildfires when he’s not destroying public land protections and calling for more drilling—just accused a sitting congressman of alcoholism in retaliation for writing that Zinke should resign. Beyond his personal foibles, he has overseen the degradation of his department’s senior work force in the name of enforcing “loyalty” to himself and the Trump administration; announced his intention to cut thousands of permanent positions; prompted mass resignations from a nonpartisan National Park Service advisory board by refusing to meet with members; and tied his own employees and aides in knots to make himself and his wife more financially comfortable. In retaliation, Zinke issued a mind-blowing statement to Twitter saying that it is “hard for [Grijalva] to think straight from the bottom of the bottle,” referring to allegations that Grijalva paid $48,000 in severance to a female committee staffer that was allegedly threatening to sue him for drunken behavior and a hostile work environment. The incident was covered by right-wing media, but as Vox noted, the incident was dismissed by the Office of Congressional Ethics, which “found no evidence to support the claim that the staffer was paid inappropriately.” Zinke also demanded Grijalva resign and pay the bill for ethics investigations of his own alleged misconduct. The #TuneInnForMore hashtag is a reference to Tune Inn, a D.C. dive bar and eatery that is frequented by Congressional staff and where Grijalva is reportedly a regular. According to E&E News, sources said Grijalva was there during lunch hours at the time of the tweet and promptly left. It’s hard to think how Zinke could have handled this worse: It’s true that Grijalva was accused of misconduct, but as the Tucson Sentinel noted, conservative media like the Washington Times that covered the alleged scandal got several key facts about the matter, such as her exact job, wrong. The congressman has been adamant that he does not drink while working, that the claims never involved sexual harassment, and that his alcohol consumption has been long under control. In October, Zinke was briefly reported to be considering firing the Department of Interior’s inspector general and filling the slot with a Donald Trump loyalist with limited experience. After a significant amount of criticism, Interior claimed media had simply gotten the story wrong.